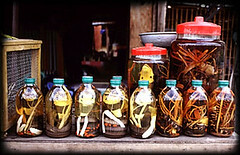 Cobras are often soaked along with herbs in large flasks of whisky which can be bought in the snake market in Phung Hiep. This potent drink is believed to boost libido in men and virility in women as well as cure all sorts of illnesses. Live snakes are also for sale in the market and are exported to other Asian countries to be used as food and medicine.